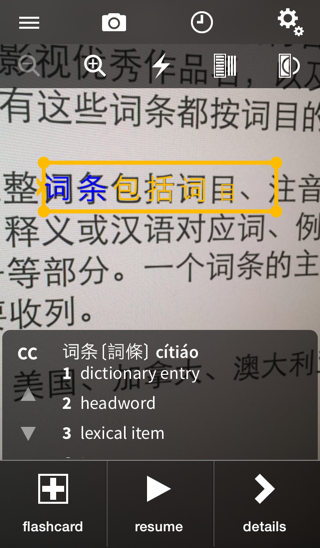 This tutorial will take you through the basics of using Pleco’s Optical Character Recognizer, which lets you look up words in + capture text from your device’s camera and from still images / PDFs. 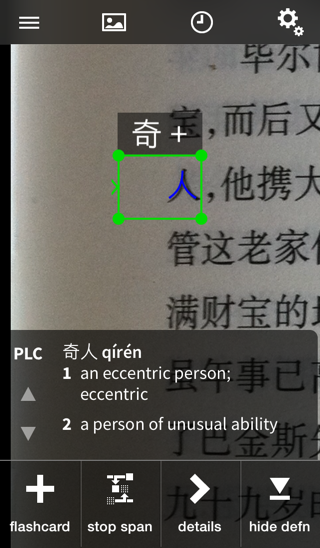 The OCR module is a paid add-on; it can be purchased through the Add-ons screen inside of Pleco. The green box here is the recognition area - Pleco will attempt to recognize whichever characters are in that box, and display their definition in the box below. Drag the corners of this box to resize it. It’s OK if the box is wider than the text - just try to match the height of the text, and make sure the left edge of the box is aligned with the start of the word you want to look up. 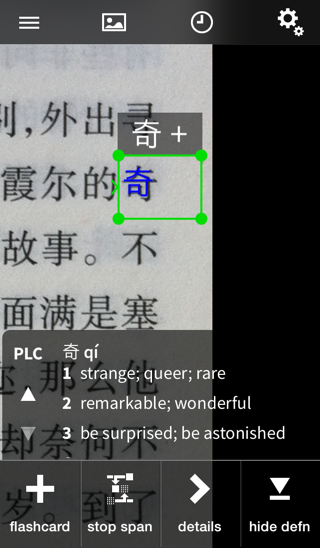 When the recognizer is paused (see below), you can tap on any character in the box to look up its definition instead, or tap on the first character of an already-selected multi-character word to look up the definition for just that character. 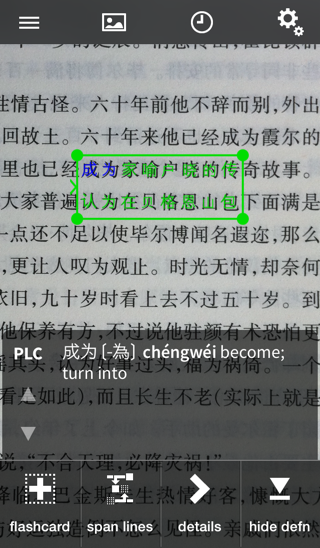 Once it does that, the text should stop updating until you move the camera a significant distance away. The first two icons zoom the image in and out. 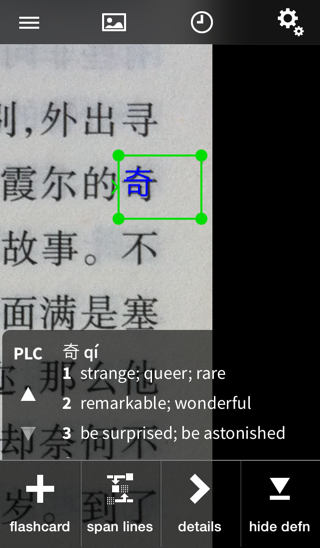 The middle icon activates / deactivates the camera flash light (for illuminating text in a dark room). The last two buttons are a bit more complicated. 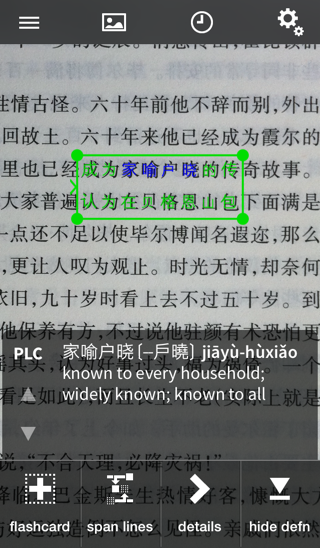 The second-to-last switches between horizontal and vertical text (Chinese routinely appears in both directions); Pleco will normally try to detect this itself, but if it gets it wrong you can tap on that button to force it to one mode or the other. The last button switches between black-on-white and white-on-black text. 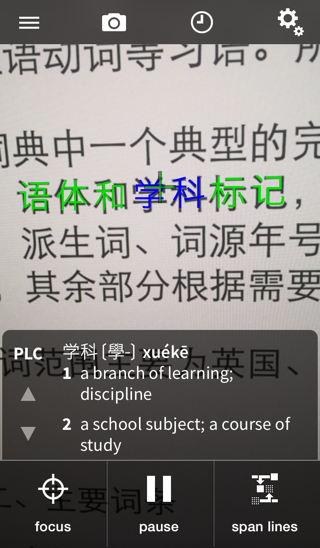 Again, Pleco can usually detect this on its own, but not always; if it gets it wrong (which generally means spectacularly / completely incorrect OCR results) you can tap on this button to force it into one mode or the other. 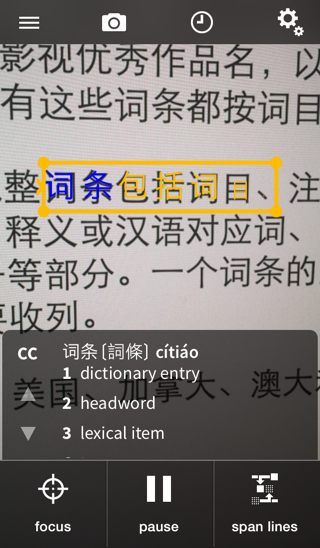 This is a bit more convenient than the box, but also a bit less reliable (it may detect the height of the text incorrectly in some cases). 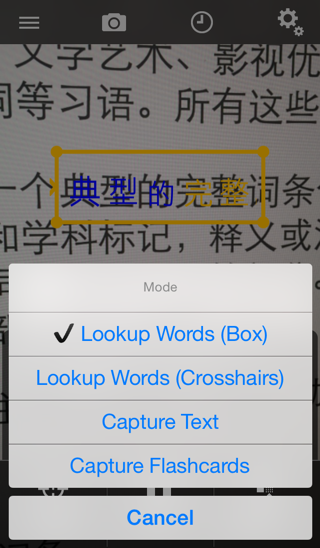 It will recognize the word most directly under the + instead of the word at the left edge of the screen. 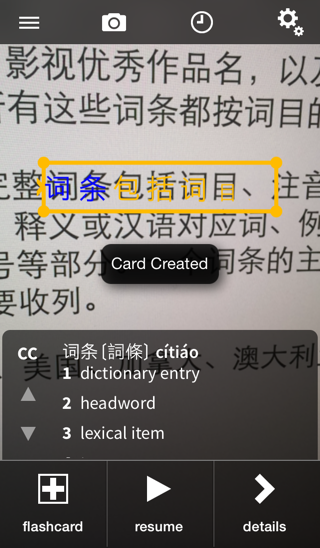 You can transcribe a list of flashcards very rapidly this way. 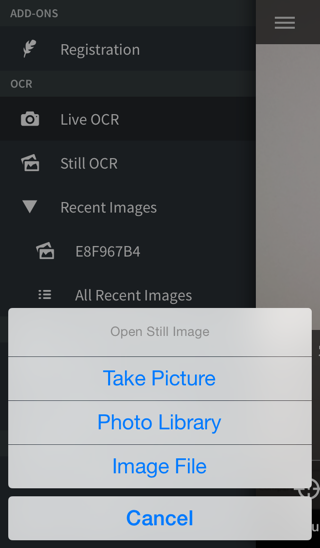 We also support OCRing of still images; you can do this with a newly taken picture, with a picture in your iPhone / iPad’s photo library, or in any image format iOS supports (JPG, PNG, etc) and also in PDF files. 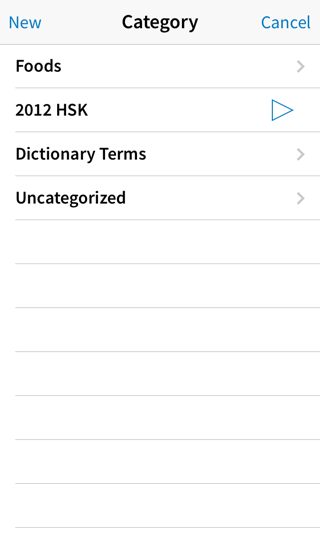 “Take Picture” brings up the standard iOS interface for taking a new picture, “Photo Library” accesses your device’s photo library, and “Image File” accesses Pleco’s document storage directory - see the reader tutorial for information on how you can copy files into there. 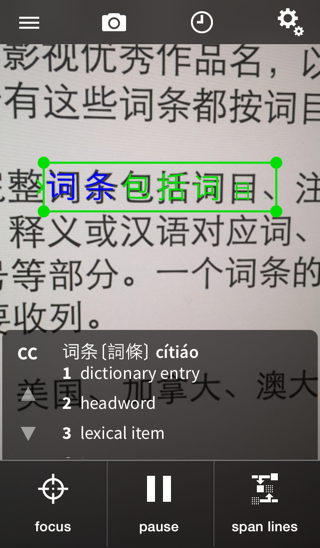 “Hide chars” lets you hide / show the green character overlay, “capture” lets you send the entire text output to our document reader, and “clip” copies the text to the clipboard. The UI for this bubble is likewise covered by the reader tutorial. 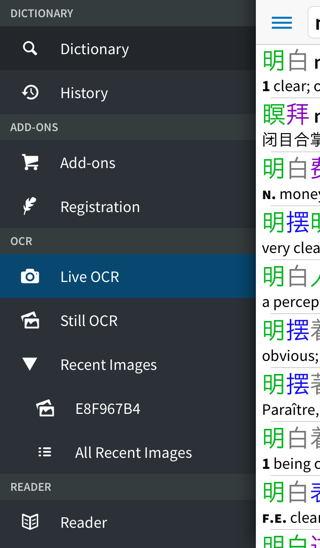 Tap on the ‘photo’ icon in the top toolbar for options to rotate the image left / right along with the same horizontal/vertical and black-on-white / white-on-black options as in live OCR mode. 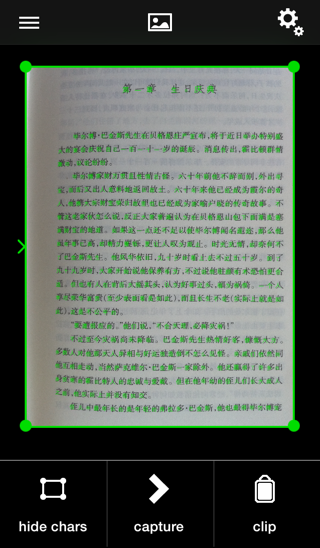 The green box here is resizable just like the one in live OCR, but it’s “sticky” - it’s attached to the document rather than to a set screen location, so if you scroll or zoom the document around it’ll still cover the same area. 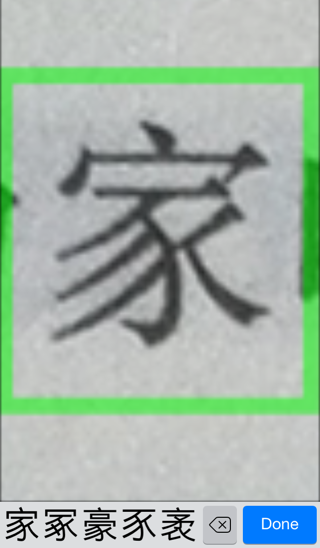 This will give you a blown-up version of the character that you can trace over to try to find it with handwriting. The candidates at the bottom of the screen will initially be set to display a list of alternate matches that our OCR algorithm came up with. 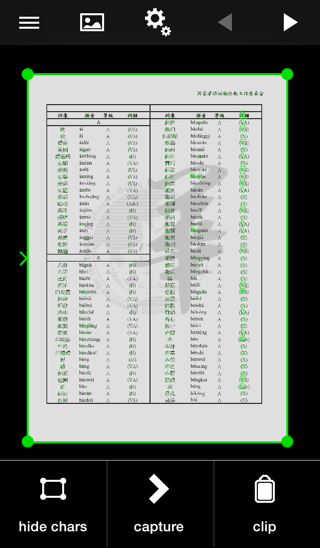 If you haven’t purchased our handwriting add-on, you’ll get a pop-up with that list of alternate matches in lieu of the handwriting box. 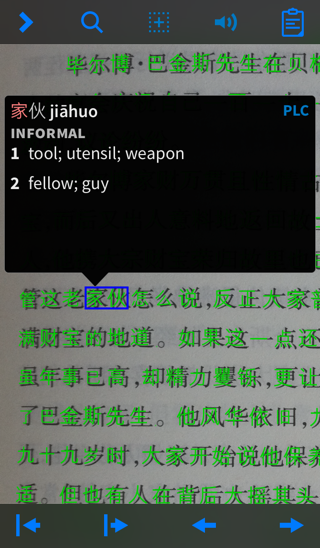 In either case, after you select the new character it will replace the old one in the OCR output. 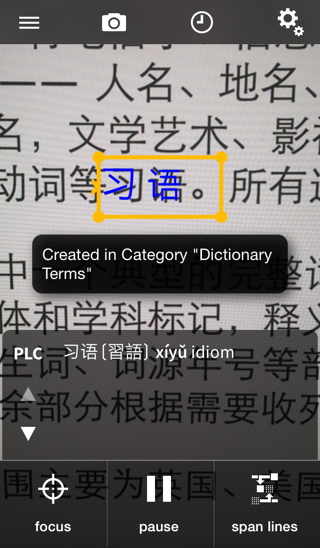 This is pretty much identical to the regular still image OCR interface, and supports all of the same modes, but adds two left / right arrow buttons at the top right corner of the screen; tap on these to navigate between pages. 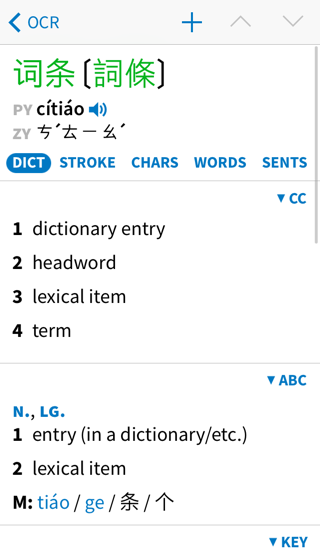 In both the live and still “lookup words” modes, you’ll see a “span lines” button at the bottom of the screen. 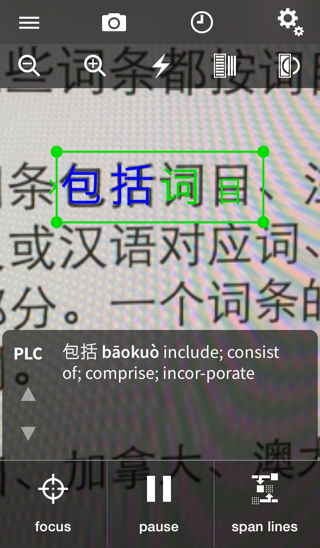 Chinese texts are generally line-wrapped without regard to words - there’ll be the same number of characters on each line even if that means that a word is cut off in the middle - and “span lines” is our way of dealing with that problem. You can also access this directly from the “History” item in the sidebar menu. 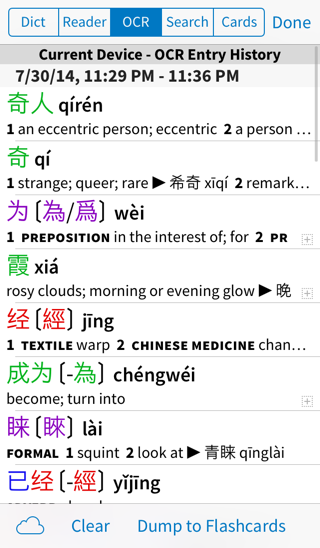 Tap on any word to view its detailed definition.